From 15 till 17th August 2017, Dr. Shafi Noor Islam participated in the 14th South East Asia Survey Congress 2017 which was organized by the Survey Department, Ministry of Development, Brunei Darussalam at the Rizqun International Hotel in Bandar Seri Begawan. He presented a paper titled 'Detecting Forest and Bush Fire Risk Areas in Brunei Darussalam: Case Analysis on Brunei Muara and Belait Districts'. The land of Brunei Darussalam is approximately 80 percent under forest cover. These forests belong to six major types. The findings show that peat swamp forest covers 17% of the total land area, and freshwater swamp forest and mangrove forest cover 2 percent and 3 percent of the total land area respectively. Table 1. Forest cover by districts with the ration of the total land area occupied by the districts respectively (Source: Forest Department of Brunei Darussalam, 2003). Over 30 percent of the peatland swamp forest is used for agriculture and 30 percent of peatland forest is degraded by logging. Moreover, peat swamp forests are prone to forest fires, which are the new threat for virgin green forests and the ecology of Brunei. 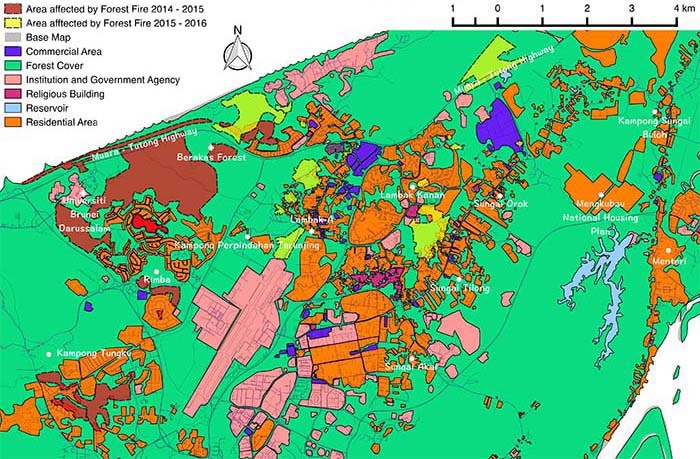 The study focused on two districts in Brunei Darussalam (Brunei Muara and Belait districts) with recurring fire calamities over the past three years (2014-2016). Since fire can cause extensive damage to natural and human resources, the study was carried out based on three objectives: identifying the potential causes of forest fire occurrences, fire distribution and frequency during the dry season. The forest and bush fire shows the different new patches within the time frame in Brunei Muara district and Belait district. To perform spatial analysis and produce maps on risk areas of forest and bush fire in Brunei Darussalam through application of Remote Sensing (RS) and Geographical Information System (GIS) software towards detect and monitoring system development for protective management of forest and natural resources in Brunei Darussalam. The study suggests that forest and bush fire awareness and adaptive educational training, applied research and mitigation component should be included in national development plan. Forest for posterity and prosperity to maintain the pristine condition of the country’s forests in perpetuity and as a key for continued prosperity in response to the national agenda of development. Forest for sustainable production in goods and services under sustainable management regime. By ensuring optimum provisions of forest goods and services in regard of its effect to ecology and environment. Forest for economic strength, maximizing economic contribution from forestry sec-tor to support diversification effort. Forest for public involvement and recreation, through the development of recreational parks in bringing people close to nature built with facilities. Forest for international prestige. As an exemplar nation in addressing global issue of climate change, biodiversity, food security and greenhouse effect. There is the need for joint management in controlling forest fire in Brunei. 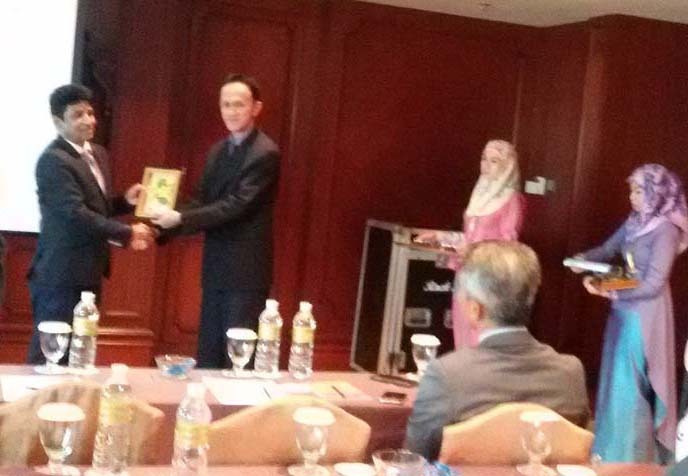 There is a need the use of remote sensing in controlling the forest fire in Brunei Darussalam. The area of forest fire in Brunei Darussalam has increased and extended in the new areas. 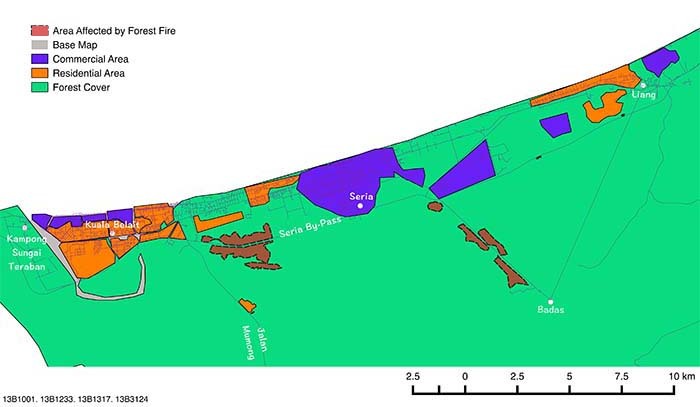 The Remote Sensing (RS) and GIS application is urgent for data collection, monitoring system development and decision support modeling towards mitigate the increasing forest bush fires in Brunei Darussalam. Regional cooperation for forest and bush fire risk assessment and mitigation approach should be implemented within a regional basis as it is a regional problem. People’s participation is urgently necessary in awareness education and training and social media could play a potential role to encourage this environmental issue. Need new research arena on climate change issue in forest fire as climate change poses threat to forestry sector in Asia pacific region as well as in Brunei Darussalam. Remote Sensing (RS) and GIS application in forest and bush fire risk areas assessment and detection for environmental planning and hazards mitigation guideline preparation. I would like to express my gratitude and thanks to my students who helped me to collect data and information. Special thanks to Yap Seew Ling Jenny, Awg Mohaidi Bin Matusin, Nur Syahiirah Bte Abu Bakar and Muhammad Hazwan bin Suhaini (Bachelor Students in the Dept. of Environmental Studies, Universiti Brunei Darussalam).